As previously mentioned, we went to De Luca's recently and picked up a few treats. 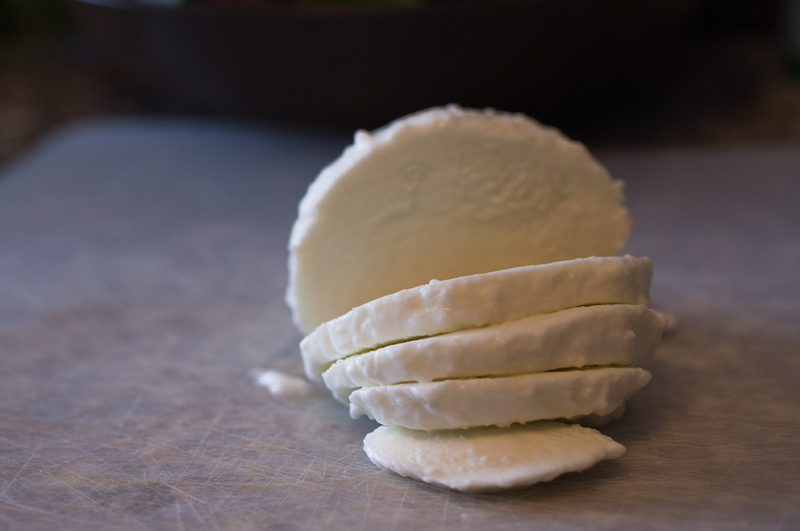 One of the awesome things we got was fresh buffalo mozzarella. The man behind the deli counter told us it came from BC raised buffalo and was just like they have in Italy. We've been to Italy. It's not the same. But it is quite nice! A ball this size wouldn't have cost more than €3 in Italy but in Winnipeg it came to over $8. Yikes! Hence it being a treat. It is the best fresh mozza we can get here. We also grabbed some fresh basil at De Luca's. 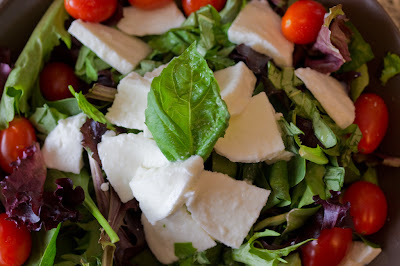 It is an absolute must for a Caprese salad. 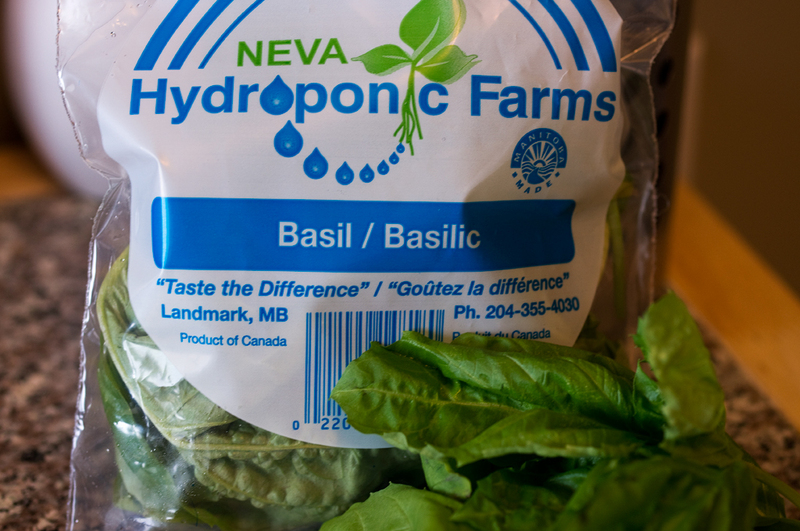 This hydroponically grown basil is available all year round and is from Landmark, MB which is located at the the longitudinal centre of Canada. Hi, mom! A Caprese salad really only requires three items; tomato, basil and fresh mozzarella. 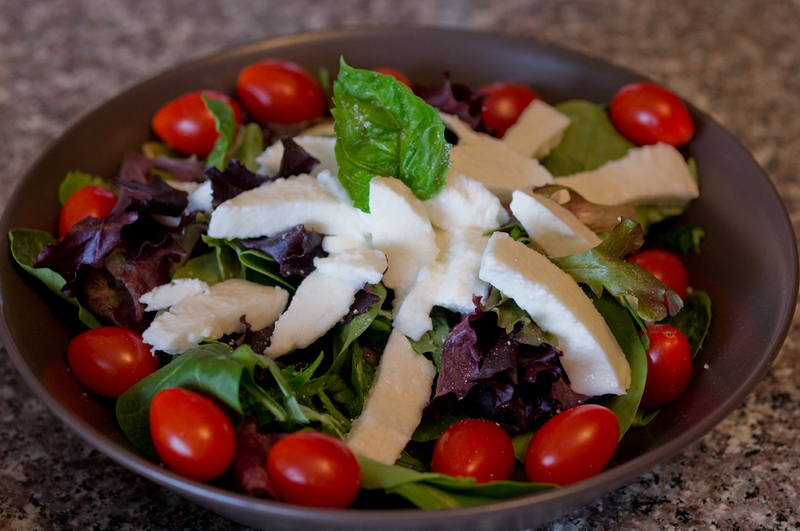 Some places will serve it on a modicum bed of lettuce but we like to prepare a full lettuce salad and top it with the cheese, tomato and basil. We also crush some dried oregano, grind a sprinkle of kosher salt and drizzle a bit of olive oil as a dressing. Unfortunately the cheese does need salt to bring out the flavours. We've been trying to make this cheese at home but haven't quite gotten it down yest. And of course, we don't have a buffalo. This is a simple, light and delicious meal. I hope you can try it at home! Love the photos! You make everything look so delicious!